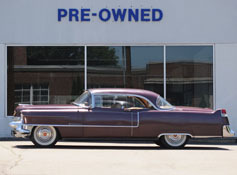 Basic body shapes were basically unchanged from 1954, with the exception of the new Eldorado model that took on entirely re-designed rear fins. The egg-crate grille spacings increased and became more rectangular. The front bumper "bullet" impact guards were now shaped like large "shell" tips. In the 1955 models the parking lights were repositioned in rectangular receptacles below the headlights. The simplest way to recognize a 1955 Cadillac is to look at the rear; above the rear bumper are six vertical louvers. Of course the widely-spaced egg-crate grille and the huge "Dagmars" (impact guards) also are a dead giveaway, although these were used again in 1956.